“Shorshe Ilish” is the signature delicacy from Bengal, which is traditionally served in a Bengali household in special occasions. Ilish is usually caught between February – March and August – October. 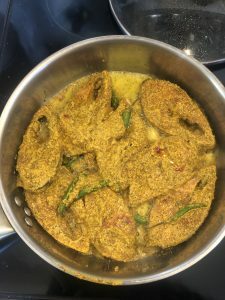 In a Bengali household, a fresh Ilish dish, cooked with Shorshe (mustard), or Dai Ilish (cooked with yogurt), or Ilish jhol (cooked with eggplant) is a mouthwatering delicacy during that time. Shorshe Ilish is cooked with mustard seeds, mustard oil, green chili, turmeric, red chili powder and mustard oil. Usually it is simply steamed in a pressure cooker or in stove top or even in microwave oven. Lot of people add yogurt, poppy seeds paste in shorshe ilish. But the simplicity in ingredients brings up the traditional Shorshe Ilish dish to the Bengalis. 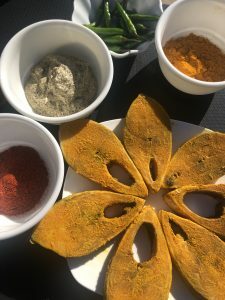 How to make mustard seed paste? You can grind the mustard seed dry or wet. I prefer to grind it wet in a Magic Bullet grinder.You can grind it dry in coffee grinder as well. Should I use black mustard seed or brown mustard seed? I prefer the black one. I find it more potent and more aromatic. What if the mustard paste makes the gravy bitter in taste? In USA, many of my friends complained that the mustard seed paste tastes bitter when they make it. I would suggest to grind it wet than grinding it dry. Grinding it wet never resulted in bitter taste. If you are in doubt, you can add plain yogurt in the recipe. Can it be made in Microwave oven? Yes, mix all the ingredients and cook it in microwave for 5 minutes. Check it after 5 minutes to make sure the gravy is not getting dry. Add little bit of water if necessary and cook it for another 3 minutes. 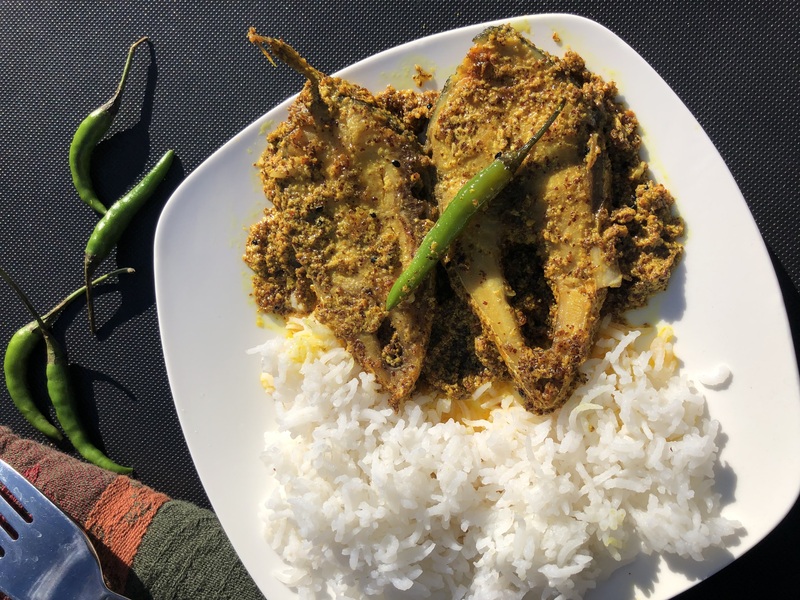 Shorshe Ilish - Delicious aromatic hilsa fish cooked with mustard seed and mustard oil, an absolute delicacy from Bengal. 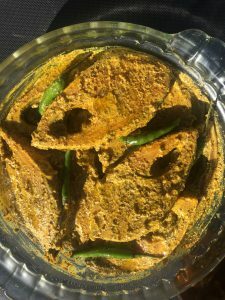 This easy simple recipe brings out the traditional Bengali Shorshe Ilish recipe that is cooked in Bengali household for special occasions. Descale the fish and marinade it with salt, turmeric and mustard oil. Soak the mustard seed in 8 table spoon water for 15 minutes and grind it. Add 2 green chilis to the paste and grind it to mis it with the paste. Cover the fish with the mustard seed paste. Add Red Chili powder to make it spicy. In the stove top, add mustard oil in a flat pan. Cook it for 7 to 9 minutes. Very carefully flip the fish after 5 min. Serve the fish with white rice. You can steam the fish in pressure cooker. Note that flipping the fish after 5 minute will be a very difficult job as the fish is very tender and the steak can break. Use caution while flipping the fish. Add mustard oil at the end for additional flavor. Please try the recipe, leave comments and rate the recipe. Hilsa is considered as one of the most tastiest fish due to its distinctly soft oily texture, mouthwatering flavour and superb mouthfeel. The fish is locally called “Macher Raja” means the king of fish. The human tongue recognizes four basic tastes as sensory responses in different taste buds, viz., sweet, sour, salty and bitter (Keller, 1985).